This little darlin of a sketch comes directly from Atlantic Hearts Sketch Challenge, it's number 26! I hardly ever follow a sketch exactly as I see it however they are a wonderfulpointbof reference. Occasionally, usually when I'm in a great hurry I follow it however I try and let the creativity of the sketch and my ideas come together! I just started randomly pulling scraps from my box and decided to make flowers. I made what I had in scraps and that totalled 5. 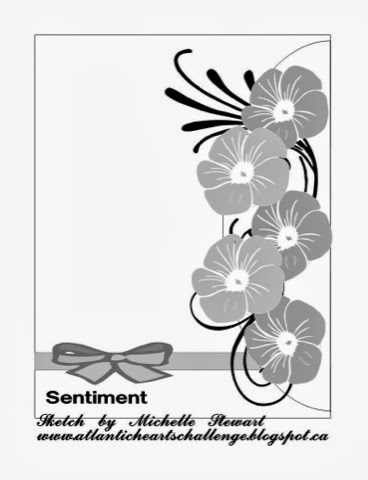 Here's the kicker, the flowers in "full bloom" were too big to use more than one (in my opinion) and not overtake the card. I used tim holtz Distress ink to grunge up the flower and edges. 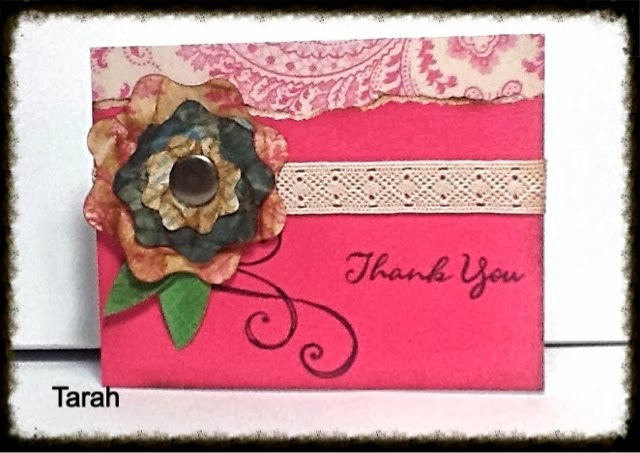 I used CTMH SWIRL stamp and a thank you sentiment from another set. The lace trim came from Decollections Lace Tape. It went together quick once I figured out what I was going to use and how I wanted it. Sometimes figuring what you will use is more difficult than putting it all together...lol. Hope your having a scrap happy day!